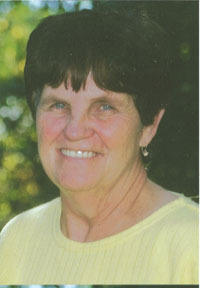 Anita Illeen Lete Young, 73, of Bellevue, Idaho, passed away surrounded by her family on Saturday, Aug. 10, 2013, at the Lincoln County Care Center, Shoshone, Idaho. Anita was born Aug. 22, 1939, at her grandparents’ home in North Shoshone. She was the third child born to Joe and Susy Lete. Due to the family sheep business, she alternated her school years between Shoshone and Bellevue through the 11th grade. She went on to graduate from Bellevue High School in 1957. On June 8, 1957, she married Charles E. Young in Hailey, Idaho. They had two children, Timothy Joe and Kelli Lynn (Jose Victorino), four grandchildren, Aaron and Adam Marcroft, Logan (Bryan Balli), and Luke Young; and one great-granddaughter, Lana Charli Marcroft. Anita went to work at the Christiana restaurant in 1965, where she worked for 29 years. There she made lifelong friends, met many celebrities and thoroughly enjoyed all her customers. She was once voted “Valley’s Best Waitress.” She later worked at Blaine Manor and St. Luke’s, once again making lifelong friends and enjoying those she served. Upon retirement, she enjoyed spending time with her family and visiting friends at the senior citizen center. She is survived by her children, grandchildren and her great granddaughter. Also surviving her are her siblings, Alicia (Dale), Eden, Mitch (Gaea) Lete and Judy (Keith) Myers; many special nieces, nephews, great-nieces and nephews and her beloved cousins. Donations in Anita’s name may be sent to St. Jude’s Children’s Hospital. The family would like to thank the staff at the Lincoln County Care Center for the loving care they provided to Anita. Services are planned for Saturday, Aug. 17, 2013, at St. Charles Catholic Church in Hailey. Please call Wood River Chapel at (208) 788-2244 for service time or go to www.woodriverchapel.com. You may also leave a condolence, share memories and light a candle.